Continuing the East Village food invasion. Had a few eating hours to kill before Ave Q (very nice) and so went back to my new favorite hang out place with a friend. Zabb Elee – How do you know if its authentic Thai if you havent been to Thailand? Bring someone with you that was there – Check. Make sure there are no curries, pad thai and Kee Mao/drunken noodles on the menu – check. I first read about Zabb Elee on SeriousEats and couldnt wait long to try it. Now I cant wait much longer to try again. A nice array of Som Tum dishes (Green Papaya salad) fills the menu and is kinda a house specialty. We tried the one with dried shrimp and peanuts – nothing like I’ve had before. I heard about how spicy this can get and it was extremely hot out so we opted for the mild version (thats the excuse I’m going with today). Really enjoyed this dish. But the highlight for me was the Pad Ped Moo Krob. 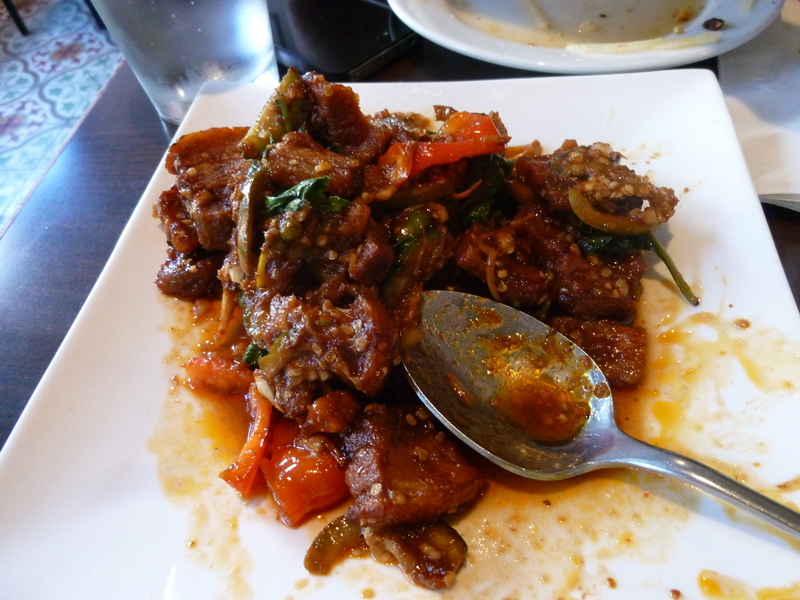 Crispy pork, green peppercorn, ginger, Thai eggplant and spicy curry (see photo). So much flavor in this one. Pork is deep fried and then fried some more… pretty much burned texture but tasty nonetheless. Very tasty!! Some of the best and unique thai I’ve had in a while. Liquiteria – Needed a cleanser. Super refreshing fresh juices. My friend is into juices and this is one of his faves. Caracas Arepas bar – What do you do when you dont like it the first time? You come back to try it again asap. Much much better this time around. My friend enjoyed the La Mulata and I got the Muchachos (to compensate for all my dessert talk) – grilled Chorizos with spicy cheese (grilled with jalapenos) and peppers. Even the Arepa itself tasted better this time. Like pita on crack.